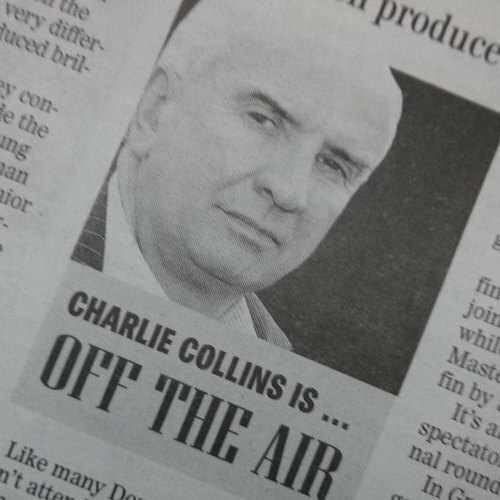 This is my column “Off the Air” as printed in the Donegal News on June 14th, 2013. Thanks to Harry Walsh. Last weekend two young sportsmen from the Twin Towns performed on the big stage in two very different sports and both produced brilliant performances. In Belarus, Jason Quigley confirmed that he has now made the successful step up from a young pretender to being the main man when he won the European Senior Middleweight Boxing title following a number of bouts against the top men in his weight. Closer to home, but also on a big stage, Lee Henderson’s ten points helped Donegal hurlers win the Nicky Rackard Cup at Croke Park. Not long back from a two month lay-off with a knee ligament injury, some of Lee’s scores were of the highest quality that you’re ever likely to see and prompted GAA pundit Martin McHugh to rightly comment that if it had been Henry Shefflin or Joe Canning then the whole country would now be raving abut his quality and skill. Those performances against proved how fortunate we are with the quality of athlete representing our county, province and country at both an amateur and professional level. Boxing is a tough sport and, at the highest level, it’s up there with the toughest challenges in any sport. After his great success at youth and U23 level Jason has successfully made the step up to the senior ranks. I think it’s fair to say that when he travelled to Minsk last week we were hopeful that he may get a medal at the European Championships with, at best, an outside chance of gold given the quality of opposition in that weight division. He was also on the tougher side of the draw which meant that he would have to be at his best to achieve his ultimate goal. Not only did Jason win gold but he did so in considerable style, losing only one round on his way to the title. His tournament was best epitomised by his final round in the final when he rallied to take gold. In a sport where there is nowhere to hide Jason stood up and was counted, producing a series of performances showing how good he already is and how great he can become. Lee Henderson stood over the sliotar in Croke Park, just inside the side line and adjacent to the VIP boxes in the Hogan Stand and with the Canal End goal in his sights. The match between Donegal and Roscommon, which had ebbed and flowed throughout, had already seen six goals shared and a multitude of points scored. I’m not sure the distance given the angle Lee’s attempt was from but it mattered little as he pucked the sliotar over the black spot to extend Donegal’s lead on their way to victory. Like many Donegal people I don’t attend too many hurling games but it was a joy to be at Croke Park last Saturday to see young men, proudly wearing the green and gold jersey, putting in such effort and commitment to succeed at such a high level. Henderson’s ten point haul made up almost one third of Donegal’s total on a day when the skill level he displayed, together with his team mates, was outstanding. The joy on the players faces after the final whistle showed what it meant to them all. It was probably best summed up by their dedicated manager Ray Durack who said that it meant as much to them as winning the Sam Maguire had to the footballers last summer. For years, there has been resist- ance within GAA circles in Done- gal to any plans to do away with the two-legged first round Championship system which has prevailed for so long in the county. Readers of this column will know that I’ve been calling for change for some time and I was de- lighted when it finally came into place for both the 2013 and 2014 Senior Championship. The new format saw four groups of four teams with the top four reaching the quarter finals and the knock out stages. Next year we’ll see the same groups but with the fixtures re- versed making if fair for everyone over a two year period. With just two round of games played it already looks like the new system has turned out to a good idea. Reigning champions St Eunan’s are certain to emerge from Group 1 with Naomh Conaill, who travel to O’Donnell Park for the last game in the group, looking pretty safe in second spot. Only a big defeat for the Glenties men and a big win for Malin over Cloughaneely will deny them a spot in the last eight. Group 2 is less clear and all the better for it. Glenfin, unfortunately, are out of the running but any two of the remaining three tams can make it through yet. against MacCumhaills will see them advance but a win for Mac-Cumhaills would put them level on points with Ardara but ahead on goal difference. Four Masters need to beat Glen- fin and hope that Ardara prevail to join them in the quarter finals while if MacCumhaills win, Four Masters would need to beat Glen- fin by a massive score to advance. It’s an excellent situation for spectators to be in ahead of the final round of games. In Group 3, only one round of games have been completed but with both of those games ending in draws it means that no matter what happens on match day 2 that group won’t be decided until the third and final series of games. Finally, Group 4 – which has been described as the group of death – will see one of the big teams fail to reach the quarter finals. The meeting between St Michael’s and Glenswilly at the Bridge early next month is a win- ner takes all contest to see who joins Kilcar in the last eight. John McNulty’s Kilcar team have already beaten both of these sides and they can relax ahead of their final group game with Bundoran. St Michael’s have to win while a draw would do Gary McDaid’s Glenswilly team. That game promises to be a cracker and one which will be worth seeing. In summary, Kilcar and St Eu- nan’s are certain to be in the last eight where you would expect they will be joined by both Ardara and Naomh Conaill which leaves four spots up for grabs ahead of the final series of games. It goes to show that change can be good if given a chance. Last week I looked ahead to the three upcoming games in Ireland’s World Cup group and which involved the three teams vying for second spot in the group behind Germany. After those game it’s a case of as you were and means that Ireland still have a good chance of qualifying for the finals. Robbie Keane’s hat-trick beat the Faroe Islands while Austria took all three points from their game with Sweden before the Swedes beat the Faroes on Tues- day night. It means that all three teams now move on to 11 points with 4 matches still to play. Unfortunately though Ireland have an inferior goal difference. Ireland have tough away games in Austria and Germany to come which means that the game at home to Sweden in September is a must win game if we are to have any chance of progressing.